Tonight I have some seminarians coming for dinner. It started with one seminarian from a former parish, calling to invite me to dinner, and I persuaded him to let me be his host instead; when he's a priest, he can take me to dinner. Until then, he belongs to, and benefits from, the "Feed-a-seminarian" program. I invited the two seminarians from this parish to join me -- one could not -- and then another seminarian sent me an email about something else, and I invited him as well. I looked through some recipes I'd saved from Facebook, and found this one. So on Monday, I got what I needed at the store, and a bit ago, I started on it. 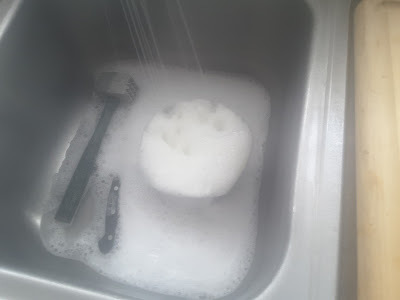 I was going to show more pictures of me pouring things in, but I had trouble with the camera on my tablet. It helps if you mash the correct button! 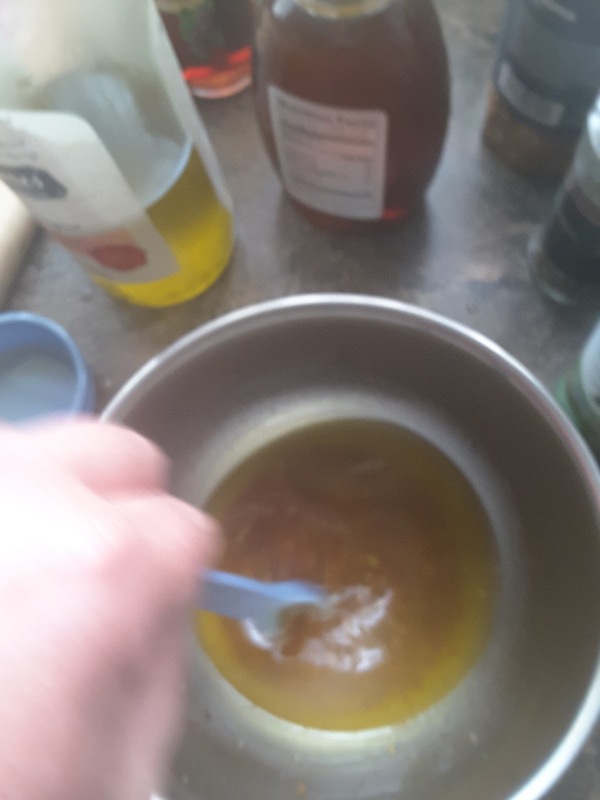 I did substitute some garlic paste I already had, for the grated garlic called for. (FYI -- if you click on the video at the link, it will take you to the recipe.) I also goofed and used table salt instead of kosher salt. Oh well. I squished it first to get almost all the air out, and then to distribute the marinade; then it went into the fridge. After that? First round of dishes. Always clean as you go, if you can. Whoops! Not yet. When I came back to the kitchen, I saw the potatoes all washed and ready to go, so I decided to finish preparing them. 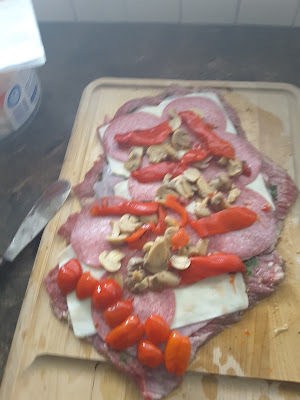 I worked from this recipe, but modified it a little; I threw in some garlic and red pepper, just because. Here are the cut up potatoes, which I'll spread out on a baking pan after Mass. 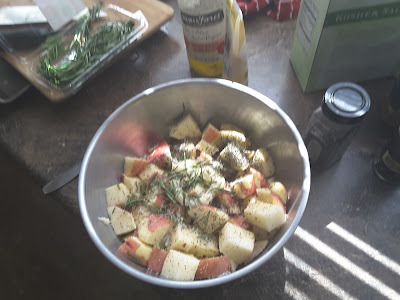 Then I worked on the herb sauce, but I am rushing a bit, so I didn't take any pictures. It's all ready, too. 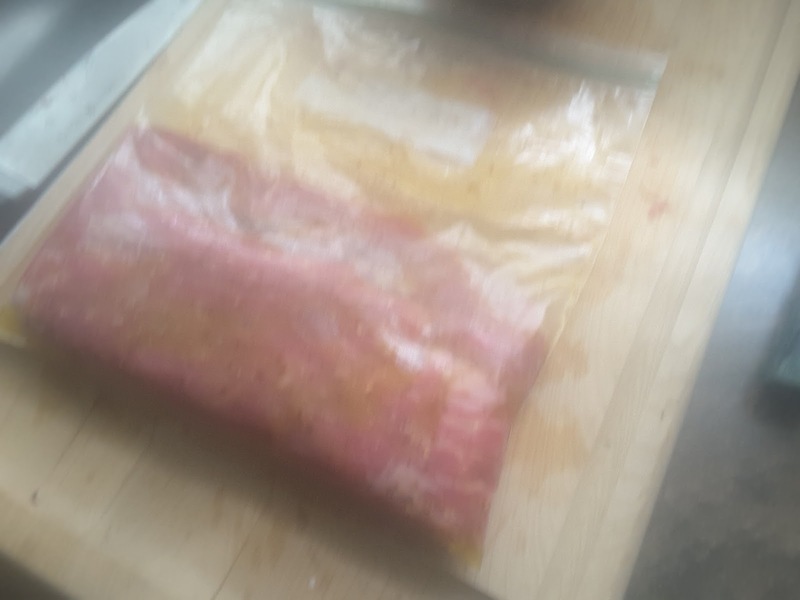 Now I wait for the meat to continue marinading, and then I'll prepare it, before I head over to church for Mass. My plan is to have everything ready to throw in the oven, or on the grill, as soon as I get back from Mass. So what's left? I have some squash I'm going to saute with some olive oil, salt and pepper; I'll cut that up before Mass if I have time, otherwise I can do that while everything else is cooking. It's a little messier than I wanted; the meat tore a little when I pounded it out, so we'll see what happens when I grill it. For the time being, I covered it with foil and shoved it into the fridge. Right after Mass we'll cook it all up, plus the squash, still to cut up and saute. Check back for more pictures (maybe)! Sorry, no pictures. When everything was ready, there was no time to fool around with the camera. But everything turned out pretty well. I left the roast on the grill a few minutes too long, but it was pretty tasty. 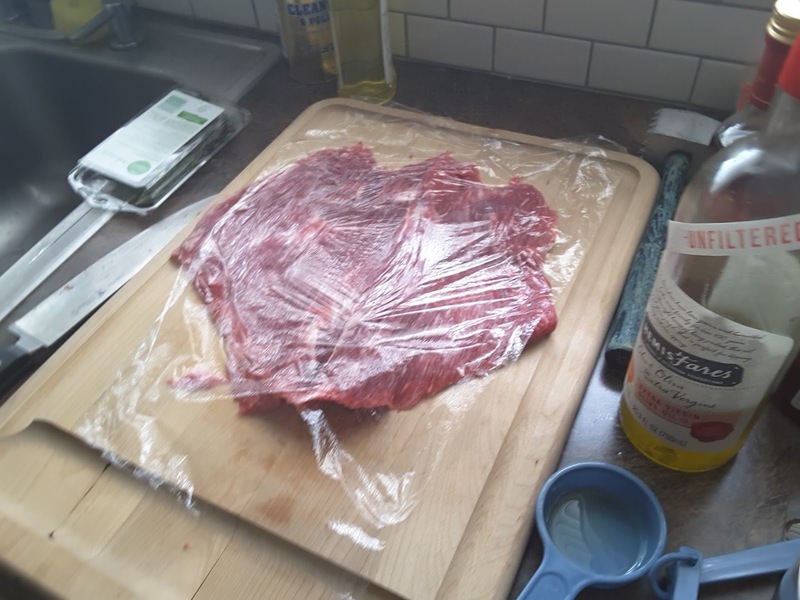 If I do this next time, I'll marinate it longer. The potatoes were done a little early, so they ended up a little crispy, but still good. The zucchini and squash was just right. We had some leftover wine. And, if any of this seems too pricey, I'll just point out that this was flank steak (a cheap cut), potatoes (cheap), zucchini and squash were donated. The wine was probably about $14, and I paid for that. The one real extravagance was the cheesecake, but that'll last several days. I did buy too much basil and parsley; the basil I'll use later this week, as I plan to make some sauce. The leftover parsley will probably go to waste -- it cost 50 cents a bunch. One seminarian didn't make it for dinner; he was baling hay with his family until about 10 pm. Wow! That looks terrific. I like crispy potaoes. 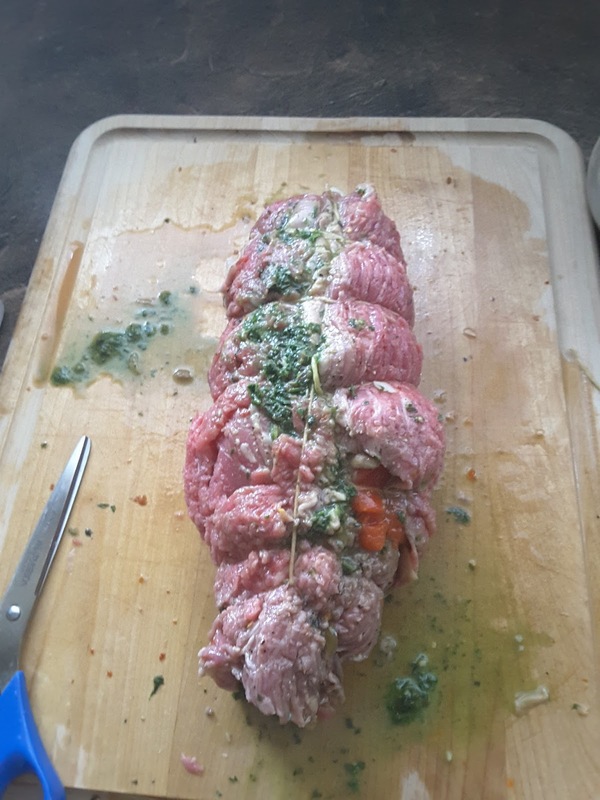 Smart to add garlic and pepper. Any left overs? Add the left over parsley chopped to top it. I am drooling. I have a similar recipe I may try next week. Stay tuned. Father, you are in inspiration in many ways. That seminarian who couldn't make it for dinner because he was bailing hay until 10 p.m. - he'll make a good priest - (in my younger days, I had to catch the bales as they came out of the bailer and stack them neatly on the wagon. - it is tough work. After reading the article - I went to the freezer in the hope of finding flank stake. 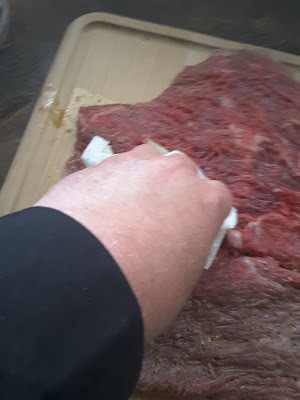 ..just came back from my weekly run to the food bank yesterday, and, among many other food stuffs, only got London broil and T-bone stakes. 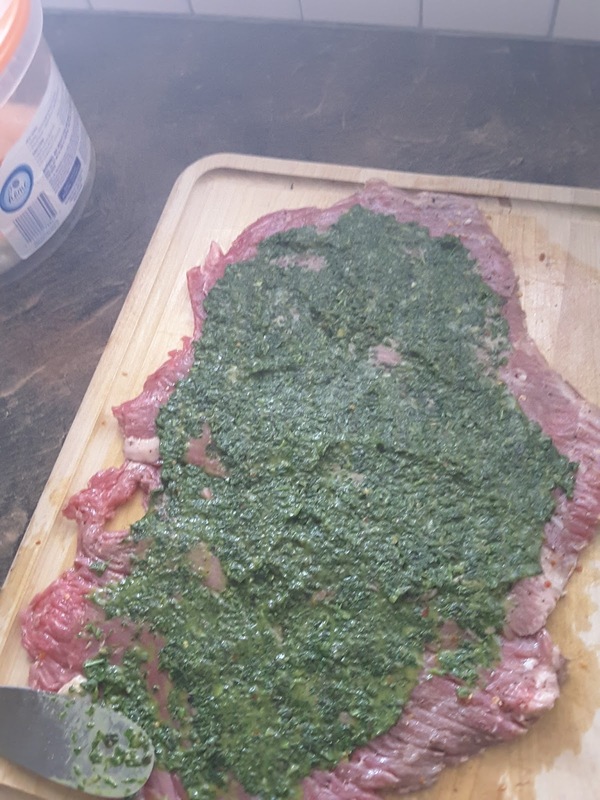 Alas, no flank steak.